Loxton's superb golf course located 8kms from the town, presents a relaxed and social atmosphere, perfect for golfing enthusiasts. 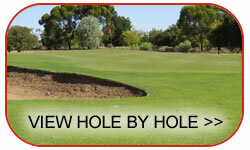 The 18 hole course has been ranked among the Top Ten courses in South Australia, the Top 100 Australian country courses and the Top 40 Australian public access courses playable for less than $40 green fees. Lush irrigated fairways provide a high standard playing surface all year, although, the course usually reaches its peak during the winter season. There are sand bunkers on 10 holes and a varied range of grassy mounds on the surrounds of most holes. The course has an abundance of mature Aleppo Pine, various gums and other shade trees lining fairways and surrounds of most holes. There are established practicing facilities situated near the clubhouse. The course is open 7 days a week apart from major events. Light traffic/immediate access most days. We have an honour box at the front entrance of the club rooms. S 34° 25' 23" / E 140° 38' 54"